The American XB-70 Valkyrie was a one of a kind aircraft when North American Aviation displayed it for the first time. On the other side of the pacific, the other super power was building an own supersonic strategic bomber. This Soviet aircraft – the Sukhoi T-4 – is what will be looked at in this article with some comparison to the XB-70 Valkyrie. They were both big supersonic bombers designed to fly at speeds as high as mach 3.0. But the Su T-4 unfortunately never got there – what happened on the way? As mentioned its name was Sukhoi T-4, however a lot of names for it has been used, such as Aircraft 100, Project 100 and Sotka. After Sukhoi had won the aircraft contest held by the Soviet leaders because of the high speed (3200 km/h) of their design, they started building the first prototype. The engineering of the Sukhoi T-4 was extremely demanding, with an enormous amount of innovation and new-thinking compared to other military projects. It featured over 600 patents and new inventions to be built such as new technologies, machinery and materials to be able to build an aircraft that was to fly at sustained speed of mach 3+ – the Speed the Valkyrie was capable of. The materials of the T-100 were, just like on the XB-70, mainly stainless steel and titanium. It also featured a fly-by-wire control and a mechanical system if the FBW would fail. When landing, the nose could be lowered to provide better visibility to the pilot, and parachutes were used to slow the aircraft down once it had touched down. However when flying, the nose could not be lowered, and therefore the pilot’s view was in steep upward direction – into the sky. This was worsening and limiting the visuality of the pilot and so a periscope was installed to make it possible for the pilot to look forward when flying, however this could only be used at speeds of up to 600 km/h. Even though the Americans retired their Valkyries in 1969, the Soviets continued to develop their T-4 and so had a complete flying prototype in 1971. Three more prototypes were started until 1975 when the project was scrapped on orders from MAI, the Moscow Aviation Institute. The last three prototypes were never finished. Some of the high-ranking officers of Soviet at the time were against the T-4 which was one of the reasons for its cancelling. It is said that Andrei Grechko (Minister of Defence) was told that “ You can have your enormous MiG-23 order only if the T-4 is abandoned”. The different T-4s got to different stages in life. The 101 and 102 were built, the building of the 103 and 104 was started and the 105 and 106 only existed on the drawing board. 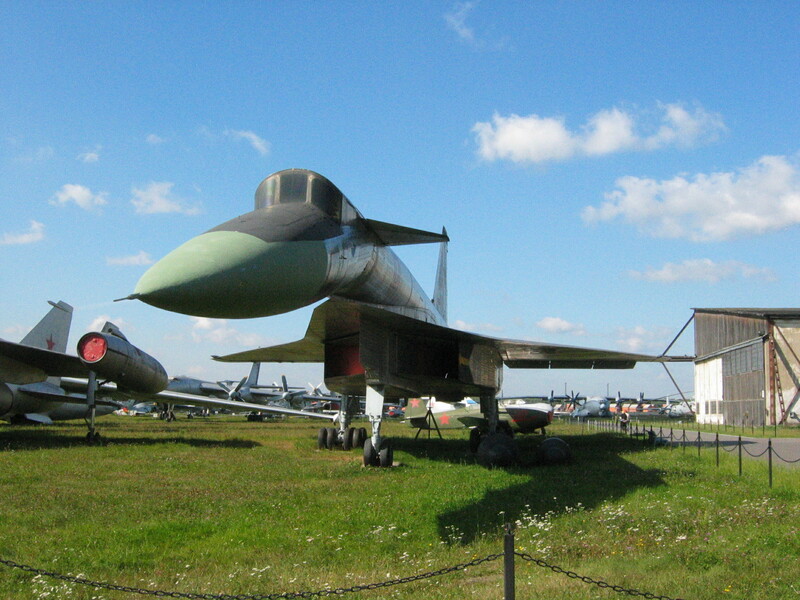 The only aircraft who completed all flight tests was the 101 and was the only one that was saved after the project’s cancellation – it can be seen at the famous Monino museum today. Even though the XB-70 got to perform more tests than the T-100 and actually achieved mach 3.0 speed, both majestic bombers got to the drawing board at the wrong time. They were technically very advanced and innovative but nevertheless they were outmatched by anti-air missiles and outperformed by ICBMs. If they had come to the drawing board 10 or 20 years earlier there would probably not have been enough technology to build them, and 10 years later they would never have seen the light as neither the Soviet or the American Air Forces saw any use of them. But as with all airplanes (almost) they were something new and even though the T-4 is rather infamous compared to the Valkyrie, they will both always be remembered. Read about a new Russian supersonic project here. Read about the XB-70 Valkyrie mentioned in the article here. Read about the fastest aircraft in the world – Sr-71 Blackbird here!